Around here, we love brussels sprouts pretty much any way you make them - roasted, shaved, sauteed, in pastas, in salads, in soups, and so much more. No matter how you cook them, they're a great building block for any meal. And they are packed with nutritional benefits. With just 38 calories per cup, these healthy sprouts are packed full of vitamins K, C, and A, and they contain folate and manganese. So head to the market, grab some sprouts, and get cooking with these amazing Crispy Balsamic Brussels Sprouts, this delish Brussels Sprouts and Bacon Pasta, or this refreshing Brussels Sprouts and Pear Slaw. 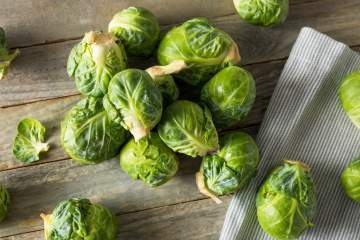 Everything you have ever wanted to know about Brussel sprouts including the delicious recipes, nutritional info, health benefits, picking them, storing them, and more.